Do you want your Etsy shop and/or blog to get featured on some amazing and popular blogs for free? I've been scouring the internet to get my shop and this blog featured and I want to share what I've found with you! OnePrettyThing (one of my favorite blogs!) features several craft tutorials a day--just send Rachel an email with your url and description. Tip Junkie tells 40,000 Facebook fans about your craft tutorials, party ideas, decorating tips, printables and more. Totally Tutorials features one craft tutorial a day for their 4,400 followers to read. Fun Family Crafts will feature your tutorial or recipe in their visual library of free craft ideas from toddler to teenager. The Crafty Crow shares with almost 6,000 Facebook fans your kids' craft tutorials. Today's Creative Blog features a new crafty blog each day. Just email her to have yours considered. Craftbits will show off your crafty tutorial for 60,000 newsletter subscribers to read! How Does She? shares your ideas, from craft tutorials to fashion to cooking to family life, with their 17,000 Facebook fans. Mod Podge Rocks shows off your Mod Podge-y projectcs with 5,600 followers. Just send her an email. Celebrations at Home has over 2,100 followers and features craft tutorials and party ideas. Craftaholics Anonymous will feature your craft tutorials and printables for over 6,700 followers to read. Dollar Store Crafts features (you guessed it) inexpensive craft ideas for almost 11,000 Facebook fans. Childmade has a "perpetual linky party" going on! You can upload your newest project any time you want and the favorites will be posted on the Childmade blog. 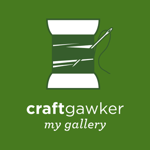 CraftGawker features your crafty projects for others to gawk at. FoodGawker features your yummy recipes for others to (guess what) gawk at. IShareCrafts will (guess what!) share your craft tutorials in a pictorial directory. IShareFunFood lets you share your fun food with their readers. ISharePrintables lets you share your (wait for it...) printables with their readers. Oh! Crafts has a network of sites that features crafts, recipes and weddings. Click on the appropriate site at the top of their page, then click the grey "Submit a cool link" button. Ucreate features craft tutorials, recipes, home decor and party ideas for their 11,000 followers. 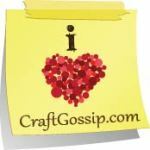 Craft Gossip shares your favorite Etsy shops, products and/or craft tutorials with their readers. Handmadeology promotes your Etsy items and treasuries and relevant blog posts for their dedicated readers. Heart Handmade blogs about your Etsy shop. Handmade Top 10 is a fun site where you list 2 of your Etsy shop items in each category and then people vote on them. It helps you get free publicity and tells you how your item compares to others in a category (Select Type, then Open on the left margin to see which categories are currently open for listing/voting). The Handmade Gift Guide features Etsy treasuries full of handmade gift ideas. Hostess with the Mostess has beautiful photos of every kind of party, as well as recipes, tutorials and printables. Design Dazzle shares your party photos/ideas, crafty tutorials and room designs with over 5,500+ followers. TomKat Studio shares your parties with almost 30,000 Facebook fans. Catch My Party shares your incredible party photos and inspiration with their readers. Birthday Girl features your gorgeous birthday party photos. Check out a blog you love. See if the blog has a sidebar or a page with all the places they've been featured, then click on each of those sites that has featured them. Look around for a "contact me" or "get featured" option on the featuring blog. Submit your project and see what happens! Another option to get featured is to join up with linky parties, blog hops or contests. You never know who will find you that way... Just find a linky at one of your favorite blogs and join in! Any other great high-profile sites that you know of that I can add to this list? Great info. Thank you so much! Thanks for the list. I'm always on the prowl for a good linky party. You're welcome. I knew that having all these websites in one place would be helpful for me in the future. Hope others can benefit, too! Awesome info! Thank you so much! What a great list! Thanks for all the good research you did! This is fantastic! Thank you! Great info - thank you !! I will definitely check out Edible Crafts! Thanks for sharing your ideas! I am now going to follow you, I wouldnt want to miss anything else you might post! Your information is terrific. You are so generous to share this with everyone. Thank you. Wow! You have compiled quite a list here! This is wonderful, I will have to start checking these out right away! Thanks for sharing this! I am posting a link to my facebook page! Just added a few more: Today's Creative Blog, Craftbits, ModPodgeRocks and Childmade. Just added Crafterminds, IShareCrafts and TomKat Studio. Great info! Thank you for your efforts. By the way, EtsyStrut is not operational, as they themselves have put it on the webpage. Thanks Kanelstrand for the head's up! Bummer about Etsy Strut! I will take them off my list. Great info, thanks for sharing. My blog is sort of different because it's a continuing story about fairies. This has inspired me to look around for child based blogs who might want to feature my stories. Thanks again!! Thanks for sharing your resources. It was very helpful! Wow! Thanks for posting this! Just popped over from the "where's the EBT blog" thread. This is an awesome resource! Thanks for sharing the fruits of your labor with us. you rock! followed you over from your "while he naps" comment...so glad i did! thank you!